Atlantic Monthly Press, 9780802123022, 304pp. Writing for magazines and newspapers for more than twenty years, including two decades at Field & Stream, Bill Heavey has become famous as America's everyman outdoorsman, unafraid to draw attention to his many and varied failures--from sporting French lavender deodorant to scaring a UPS man half to death while bowhunting in his front yard. Heavey's 2007 collection If You Didn't Bring Jerky What Did I Just Eat?, co-published with Field & Stream, the leading American outdoors magazine, was a resounding success that went into multiple hardcover printings. This new book, again co-published with Field & Stream, collects more of Heavey's top pieces from the magazine, as well as the best of his writing from the Washington Post and elsewhere. In this far-ranging read, Heavey's adventures include nearly freezing to death in Eastern Alaska, hunting ants in the urban jungles of the Washington, D.C. metropolitan area, and reconnecting to cherished memories of his grandfather through an inherited gun collection. 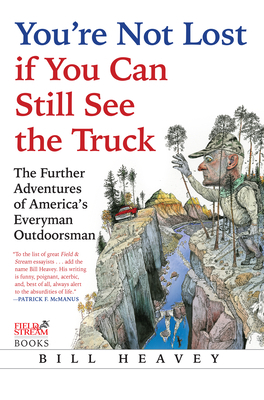 With Heavey's trademark witty candor, You're Not Lost if You Can Still See the Truck traces a life lived outdoors through the good, the bad, and the downright hilarious. Bill Heavey is an editor at large for Field & Stream, where he has written since 1993. His work has appeared in numerous publications including Men's Journal, Outside, Washington Post, Los Angeles Times, and Best American Magazine Writing.